School lunches are provided and cooked on the premises by Caterlink, an award winning food service provider working with schools across London to serve a menu that is freshly prepared daily using local and regional produce. Sample menus are available in the school office. Or click on the link below for this terms menu. Specific dietary requirements, whether for medical or religious reasons, are noted. A vegetarian choice is also always available. Children may bring a packed lunch into school if you prefer. If so, please make sure that you have read our Packed Lunch Policy which lays out our expectations of a healthy meal. Children are unable to mix school and packed lunches on a day to day basis. The school office require notice of ONE WEEK for any changes you wish to make. To make sure that children who bring a lunch from home to eat in school (or on school trips) have food which is just as healthy and nutritious as food now served in school and regulated by national standards. 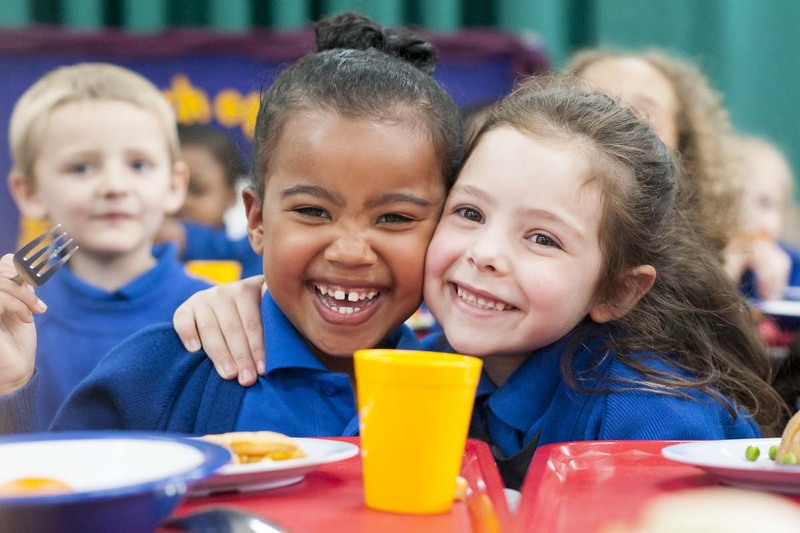 The government has placed a duty on schools to ensure that every child is healthy and has invested hugely in improved school meals, free fruit for schools and The School Food Trust and NHS encourage healthy eating. The trust recommends we have a policy and this one is based on their model. Learn quicker and behave better. School meals conform to government nutritional guidelines with less sugar, fat and salt and fresh fruit and vegetables. There is no reason why a packed lunch cannot provide the same nutrition as a school meal. Unhealthy and sugary foods contain fast release energy, which can cause hyperactivity and tiredness. Healthy foods contain slow release energy which helps children stay alert throughout the day. Eating healthily helps children to concentrate and have a more productive time at school. However, if you would like further information about providing a healthy packed lunch please visit www.nhs.uk/change4life for more information. Who does it apply to and when and where? To all pupils and parents providing packed lunches to be eaten within school or on school trips during normal school hours from the summer term 2015. If a parent wishes to provide a packed lunch for their child then please inform the school office. If your child wishes to change from packed lunch to school lunch then the office require a minimum of one weeks’ notice. The school will provide facilities for pupils bringing in packed lunches and ensure that free, fresh drinking water is available. The school will work with parents to ensure that packed lunches are as close as possible to the guidance below. Parents will need to provide children with a suitable container. A plastic box with a removable lid is ideal. Children must only eat their own food and not other children’s. The policy has taken account of the guidance issued to schools, along with a survey of past packed lunches. The NHS Eatwell Plate highlights the different types of food that make up our diet, and shows the proportions we should eat them in to have a well-balanced and healthy diet. It’s a good idea to try to get this balance right every day, but you don’t need to do it at every meal. Eating healthily is about eating the right amount of food for your energy needs. Meat, fish or other source of non-dairy protein (e.g. lentils, beans, soya or houmous,) every day (usually as part of a sandwich, roll or salad).Oily fish, such as pilchards, salmon or tuna occasionally.A starchy food such as bread, pasta, rice, noodles, potatoes or other type of cereals every day. Banana sandwich on wholemeal bread, tuna and sweetcorn wholemeal roll, pasta and sausage salad, ham and lettuce pitta pocket, houmous, red pepper and grated carrot wrap, tinned sardine bagel, egg and tomato roll, corned beef sandwich on wholemeal bread, wholemeal English muffin pizza (with cheese, cherry tomatoes and spinach), double-decker wholemeal sandwich with ham and salad, tuna pasta salad, chicken wrap, tinned salmon salad baguette (with cucumber, lettuce), rice with beans and salad and chicken strips. At least one portion of fruit or vegetables every day. Tomato, satsuma, nectarine, grapes, kiwi, vegetable dippers (such as: carrot/cucumber sticks, red and green pepper strips), pear, banana, fresh fruit salad, raspberries, orange, mango etc. Dairy food such as milk, cheese, yoghurt, fromage frais or custard. Low-fat yoghurt, fromage frais, reduced fat cheese triangle, yoghurt drink, creamed rice pot, oatcakes, dried apricots, low fat cheese with vegetable dippers and fresh fruit smoothie. Desserts make up a small amount of our meal which are high in fat or sugar. Small box of raisins, small flapjack, slice of malt loaf, mini blueberry muffin, slice of banana cake, dried fruit, fruit scone and Cereal bars. Drinks. Water (provided by school), semi-skimmed milk. Confectionery such as chocolate bars. Sweets are not allowed at lunch or any other time. Nut or nut products (although they can be very healthy) because of the danger to other children with allergies. Fizzy drinks as these are mostly very unhealthy and are likely to make a mess and spoil food. No flavoured water. Any foods which have been fried in oil. The school also recognises that some pupils may have verified medical conditions requiring special diets that do not allow for the standards to be met exactly. Pupils on special diets following verified medical advice will be given due consideration. In this case parents are urged to be responsible in ensuring that packed lunches are as healthy as possible. If necessary please speak with our senior midday meal supervisor, Mrs Kelly Sutton. Packed lunches are reviewed by lunchtime staff as part of their supervision of the children. Children eating healthy lunches are rewarded by stickers and other awards. Children who do not appear to be enjoying their lunch (eg; refusing to eat certain foods, not eating the majority of their meal) will receive a note to inform parents/carers. Meal supervisors will make a ‘smart swap’ and provide your child with an alternative from the school menu. Meal supervisors will send a note home to inform parents. If this persists, the parent would be invited to a meeting with the midday meal supervisor and a school leader. The school community will be informed of this policy and will work together to support its implementation. The school will write to all existing parents/carers to inform them of the policy via the school newsletter. The policy will be available on the school’s website and will be incorporated into the school prospectus. The school will use opportunities such as parent’s evenings to promote this policy as part of a whole school approach to a healthier lifestyle. How will we know that this policy is successful? Children are fitter and healthier. Children learn quicker and behave better. Regular Taster events for parents/carers and children encourage positive attitudes to a healthy lifestyle. Special dietary requirements are met. Packed lunches provide a good balance of different types of foods. School supports parents/children to make healthy choices through the use of the nhs.uk/change4life website. Regular questionnaires to encourage feedback about lunch provide school with suggestions for improvements. Midday meal supervisor will review this policy in January 2016 with staff, parents and children.